As I finish off my 3rd week here, I’m starting to get find my routine. Speaking for myself, having a regular ~7 hour sleep schedule is glorious– and a marked improvement from my (unfortunately quite regular among the SWEboard) 5 hour power nap that sustained me last year. During international orientation, many of my peers remarked that one of the main “culture shocks” is the pace of life in London. Hmmm, fast paced, you say? I guess when you’re used to riding a roller coaster, life on the expressway seems rather manageable. My current routine for Sunday is among my favorite: mass & a museum. Last week was at St George’s Cathedral in Southwark which was just a 15 minute walk south of my apartment. I met up with one of my friend’s from UM (who is also studying for a year in London) for the 10am “Family Mass”. Unlike the congregation at English Martyr’s 9am mass, the crowd was much more diverse: as Wikipedia confirmed “every Mass is attended by people of different ethnicities and ages ranging from African to Asian to European.” Perhaps it was more noticeable at this “family mass”, but children were definitely a-plenty. The typical attire was also much nicer– my skirt & dress top were no match for the standard Sunday’s Best. Going back to what I had said earlier about my enthusiasm for learning about the community through their worship services, this week was an excellent lesson in history. Here is a summary of some interesting points from the St George’s Visitor’s Guide that I picked up. 1852: Officially becomes a cathedral. Be sure to click on the pictures to see an expanded view and caption. Now understanding a bit more about their history, these “white glass” windows (with plans to be replaced with stained glass) make a bit more sense. So difficult to capture stained glass! (At least for the amateur photographer.) This window commemorates PJP2’s 1982 visit and Liturgy for the Sick. The 10am “choir” was comprised of 6-8 girls in their teens. As we were leaving the church, the 40 person boy’s choir was warming up for the 11:30am mass. How beautiful! I definitely foresee myself coming back here. Memorial for Fr Thomas Doyle, founder of the Church. St George slaying the dragon! Since the cathedral bears his name, I was anticipating something more grandiose, but this ~4 foot tall statue was actually kind of hard to find. The entrance to the Imperial War Museum is just a stone’s throw away from St. George’s. Upon arrival we received tickets to their current special collection on WWI; good thing that we arrived near the beginning of the day because they were already booking 2 hours in advance (to manage foot traffic). Any tourist guide that I’ve seen ranks the IWM as one of London’s best attractions, and after visiting, I can definitely see why. Again, be sure to click on the pictures to see an expanded image with caption. View from the outside of the museum. I’ve had to shift my definition of “beautiful day”– blue skies aren’t very plentiful here, but the sun has a way of making the clouds look absolutely stunning. Displaying bullet holes in signs is impactful. Using signs for Tube stations that I, and many of the visitors here, have used on a regular basis– jarring. Again, it starts to put things in perspective. Smile! You’re on the BBC! Refrain from flash photography while the BBC is filming… Or just climb to the 4th floor for an aerial view. Another example of making these museums accessible to everyone. This informational video not only contained subtitles, but also sign language. 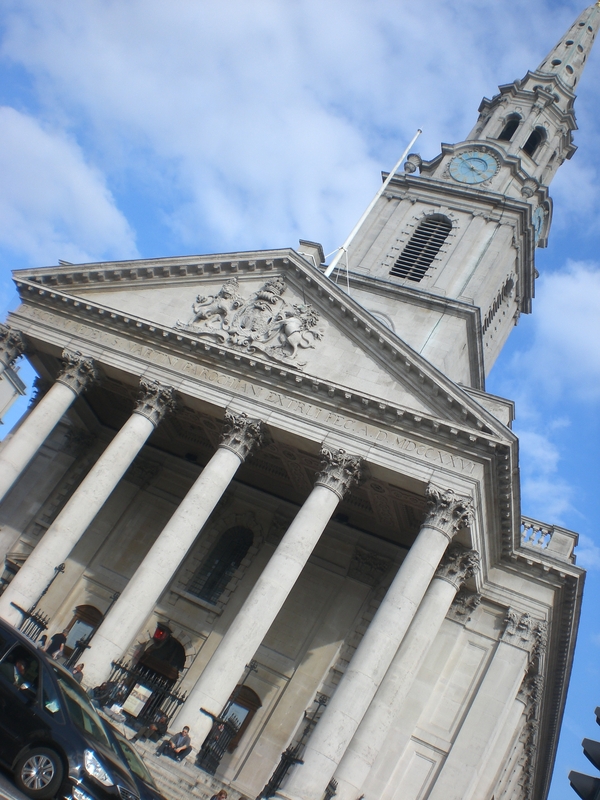 Since “Family Mass” seemed to go well, we decided to give that a go for this week, too– this time at the Brompton Oratory. This was the most conservative parish of the three that I’ve been to since I’ve arrived. A number of the women I passed on my way in were wearing lace veils; I later learned that the 9 and 11am masses (2 of the 7 masses they say every Sunday) were “1962 Missal” and “Latin High Mass” respectively. Large signs were on the doors requesting that visitors refrain from photographs, but you can view images from their photo gallery on their website. The 10am “Family Mass” had an unbelievable children’s choir: 5 boys, ~35 girls with a glorious blend (and impressive vowel matching!) that suggested skillful instruction. There may have been a hymn book for people to pick up on their way into the church, but I must have missed it. It probably wouldn’t have done much good anyway since I’m unfamiliar with the local music and the common hymnal around these parts only has words (no music). And anyway, the congregation only joined on the opening & closing songs; everything else, including all the mass parts, were sung by the choir. Though I really enjoy singing to participate, being “forced” to just listen provides a unique opportunity that I am very grateful to have had. The priest focused his homily on this week’s Gospel (click here for the excerpts) which excellently complemented the philosophy reading I have been doing this week on Moral Theory. What is right? Good? Just? More on this to come soon! 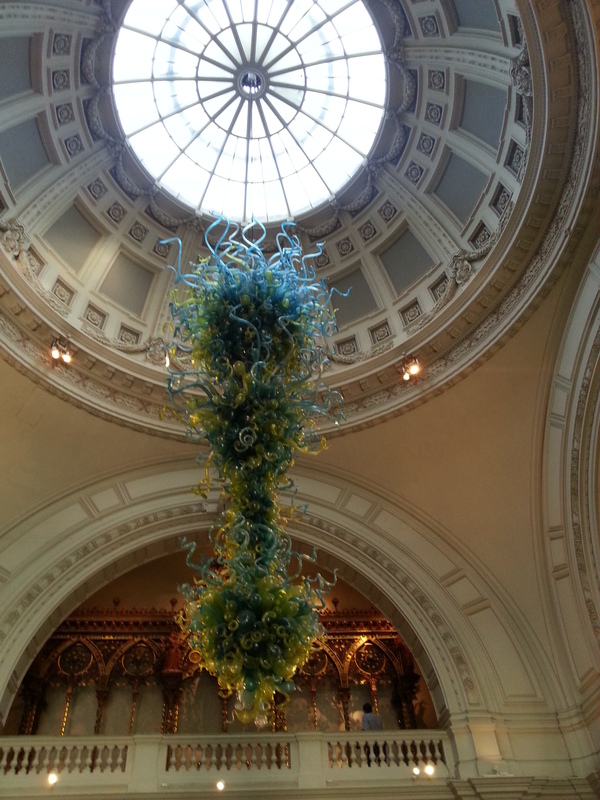 The Victoria & Albert (V&A) Museum of art & design was literally next door, so a post-mass visit only seemed fitting. USA represent! VA Rotunda Chandelier by Dale Chihuly of Seattle , WA. The museum is quite large, so I dedicated this visit to the Medieval and Renaissance wing. Enjoy a few rounds of Identify Me, similar to Interpret This except there are correct answers this time. Check out those wing sockets! Fun fact: September 29 is the feast of St Michael the Archangel. Termed “Michaelmas” this date falls near the summer equinox each year and, conveniently, the beginning of the academic “fall term”– or as KCL (and other institutions) refer to it, the Michaelmas term. Check out this short Wikipedia article for a bit more info. Classes began this week! To keep you oriented on what I’ll be doing this year, here are some quick facts. Students: 20 in total– 10 UK / 10 international, 15 full time / 5 part time. Backgrounds include philosophy, sociology, anthropology, biomedical sciences, medicine, theology… and of course engineering 😉 Bios are slowing being added to our program website. Feel free to check it out! Credits: 180 UK credits– 60 credits in both the fall & winter semesters and 60 credits for writing a dissertation in the summer. Just as £1 ≠ $1, 1 UK credit ≠ 1 US credit. From what I’m told, UK credits indicate the number of direct teaching / contact hours in the semester. Then, multiply it by 10 to indicate the amount of time that is required for that course over the whole semester. So a 30 credit course requires 300 hours of work over the semester. At 60 credits and 11 weeks of teaching (a normal course load for UK students) that’s 55 hours a week. Seems a bit dubious if they also believe in a 35 hour work week… I’ll try to keep you posted with a more accurate account. Evaluation: Required (but not graded) “formative” midterm essay. Required and graded “summative” essay. “Written final” the first week of January where we will write 3 “mini essays” in 3 hours for each course. This means that my grades will be 50% summative essay, 50% written final. Certainly different from having engineering problem sets, lab reports, and exams! 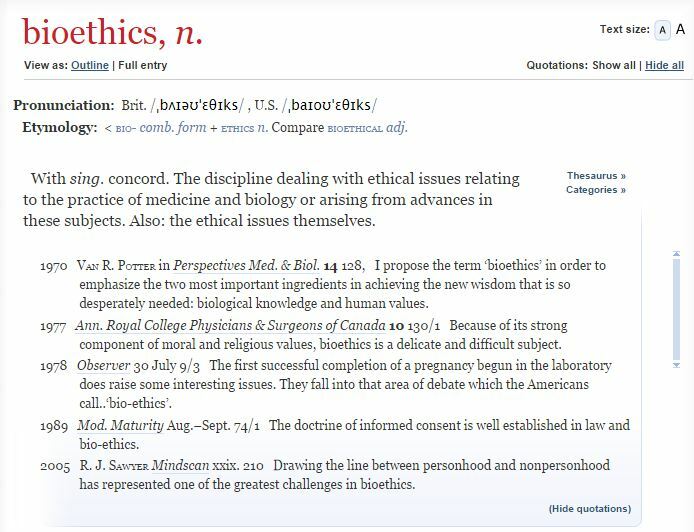 Our readings & discussion for the first week centered around tracing the origin as well as looking to the future of the term bioethics: Why was this specific term used? What did it mean in the various cases? What cases have been instrumental in shaping our understanding of bioethics? What is unique about a program that invites philosophers, sociologists, theologians, and scientists (and an engineer!) into the same discussion? Why is this diversity so valuable? Interestingly enough, one of the two main “origin theories” is not published in the Oxford English Dictionary: the establishment of the Joseph and Rose Kennedy Institute for Bioethics at Georgetown University in 1971. Nuremberg Code — developed after WW2 in response to the Nazi medical experiments. Somewhat surprisingly, this didn’t have that much effect on the development of the bioethics in the United States. Medical professionals didn’t think that it was very relevant to their work because the crimes committed by the Nazis were clearly barbaric (not in the grey area). Tuskegee Syphilis Experiment — and yet, here’s an example of history being doomed to repeat itself. If you are unfamiliar with the 1932-72 case (as I was!) here is a brief synopsis. The Belmont Report was developed in response to this case in 1978 and a formal Apology to Survivors was issued in 1995. Guatemala Syphilis Experiment — repeating history again, and again… Here is another brief synopsis from the 1946-48 research as well as the full government review published in 2011. I haven’t yet had my FSSHM lecture this week, but I’ll report back when I do. Since we had a few hours before the Comedy of Errors began at the Globe, we decided to walk next door to the Tate Modern Museum. My first memorable introduction to Tate Modern was via this lil documentary that my brother posted on my facebook wall this summer: Why Beauty Matters (Roger Scruton – BBC, 2009). Less eloquently summarized by the river boat captain: if you’re interested in seeing a building dedicated to displaying rubbish posing as art, make your way over to Tate Modern. Ouch. Feeling like that was undeservedly hostile, I wanted to see for myself so I could draw my own conclusions. I remember being introduced to Picasso in those Art inserts in my elementary school literature books. His works were indeed… different from more classically trained artists, but from my perspective he pushed boundaries without jumping off the deep end like Duchamp did with his “Fountain” (harshly criticized in Scruton’s documentary). Defining any random object as art does not necessarily make it so. I further grew in appreciation for Picasso when his work was discussed in my UM English class: “more” does not always mean “better”. His classical skill is not as well publicized, probably because he rejected that style to portray the world in a unique, profound way. I understand that just because something is “unique” or “profound” doesn’t necessarily make it art, but Picasso was definitely on to something. I feel confident in disagreeing with the river boat captain’s claims, but there were some pieces in this gallery that were more… dodgy. Enjoy a few rounds of Interpret This. Feel free to jot down your guesses in the comment section! 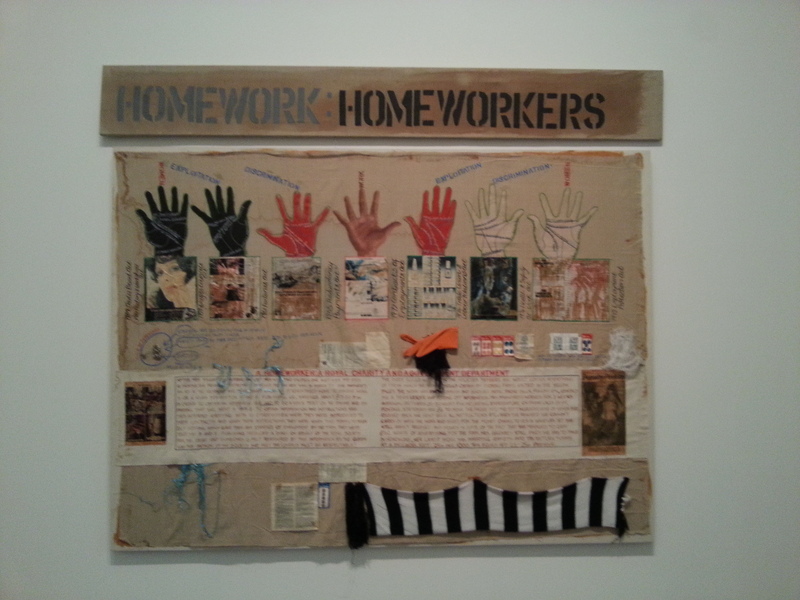 Each picture is followed by Tate Modern’s description of the work so you can check your “answers”. 2) as a student of Bioethics (background in engineering) I was… a bit out of my league. MD, a recent graduate in English was now focusing on Shakespeare at King’s. And AB, who had previous studied abroad in London during her undergraduate days, was taking a “sabbatical” from teaching high school literature to focus her master’s studies on Modern English Lit. Did I mention I’ve met some really cool people? AB came well prepared with a list of shows, theatres, performance times, and potential discounts. We decided to try for War Horse first, and made our way to the queue outside of New London Theatre. No dice. We were number 10, 11, & 12 and gentlemen 8 & 9 were requesting 5 tickets between the two of them. Taking full advantage of the fact that we live here and thus aren’t under and significant pressure to book today, we made the game-time decision to head back to Matilda at the nearby Cambridge Theatre. No Monday show! Rats. As the clock ticked toward 10:30am (30 minutes after most box offices open) we picked up our walking pace and *luckily* there were still 3 available £15 front row tickets to Shakespeare in Love that evening. “Well, I have a young neck,” MD offered with a smile. We met at the theatre about 45 minutes early which gave us ample time to marvel in the design of the 4 level theatre (ground, mezz, balcony, amphitheatre). The stage was indeed tall, but we folded up our jackets to sit on and did some good neck stretches before the opening number. For those of you that are unfamiliar with this musical (play with music really, not the traditional 20 song and dance routine musical) here is a short synopsis of the film version. At this point I’d like to offer a few big shout outs. First to my middle & high school literature teachers, especially Mr Havlicek– were it not for the exceedingly large amount of Shakespearean verses that I was required to memorize, I may not have been able to digest the allusions and witticisms that made this musical so entertaining. Secondly, I’d like to thank those that have had a key role in my music education, most recently, Professor Mengozzi. Though I initially resisted learning about the Renaissance period in Musicology 345, I amazed myself with the technical attention I was able to give the madrigal musicians. We were initially just planning on booking tickets today for a show next week, but the schedule was a bit dodgy and with only a few weeks before the outdoor theatre closes for the winter we didn’t want to press our luck with navigating class schedules and rainchecks (where they distribute ponchos or move the show indoors.) So the 2pm matinee it was! We arrived an hour before the start of the show to join the Groundling (£5 tickets to stand throughout the 2.5 hour show) Queue. They did a bag check upon entry which was so quick, I couldn’t imagine they could actual detect any traditional weapon. Maybe they were searching for tomatoes and cabbages? Though there are no bad seats when you stand and the stage is a good 5 feet off the ground, if you are in the front row, you can lean against the stage. Just be careful when an actor comes running toward you! Inside the Globe as the audience begins to shuffle in. The ceiling of the stage. Brought to you exclusively from the Groundling perspective! Looking at the stage. No, that’s not real marble. Willing suspension of disbelief allows parts of it to be thrown throughout the performance. Post-performance. The clean-up begins– another show is scheduled for tonight! Encore? I think this was a high school group. Not quite sure how these kids fit in the performance. They were off to the side and appeared to be playing Zombie… but the chance of having two groups with red pants… well that’s just a lot of red pants. A lil park attributed to Shakespeare that I found on an exploration walk through the city last night. Full 360. Panoramic view is kind of dodgy in the globe, but it’s kind of fun to flatten out a circular theater. Though I’ve never formally studied the Comedy of Errors, it is not the most difficult Shakespearean play to digest. Since the actors were so dramatic in the telling of the story, I may not have even needed the quick pre-show skim of the plot synopsis. I again was impressed with how intentional the directors (and actors) were about making this form of art accessible to the common man. As an actual Groundling, I was quite appreciative. 😉 During one interlude twin members of the chorus came out to sweep up the mess caused by Dr Pinch (the faux wizard) and within a few seconds a quidditch match was underway! Another interesting modernization was inserted in Act 3, scene 2. D: I found it by the barrenness; hard in the palm of the hand. It is certainly an exciting time to be in the UK! I learned that my walk back from Shakespeare in Love just missed a rally on Trafalgar Square in which Londoners were making their case for Scotland to stay in the UK. Such a pity that I’m not able to report live from the scene, but I’m certain that whatever tomorrow’s vote may bring, interesting commentary is sure to follow. Week 1: Call me a tourist? I really enjoy participating in mass when I travel because in addition to the religious aspects, it provides a unique perspective on the culture and community. On Sunday I went to “Roman Catholic Church of the English Martyrs” since it was in the direction of the Whitechapel art gallery that I was planning to visit that afternoon with some friends I met during orientation. Their 9am mass– one of two masses that are said at that parish each Sunday– had ~50 people most of whom were 2, 3, and 4 times my age. Hymns were led by one man singing very loudly in the back of the church and and each member of the congregation could pick up a hymnal (or rather, prayer book as it only had words and no music) on their way into the church. Fitting to the church’s namesake, one of the petitions and a good portion of the homily was focused on David Haines, the British man who was recently beheaded by Isis. Though Mr Haines was not a parishioner of that parish and it is reasonable to suppose that nobody in the church that morning knew him directly, they came together to grieve for the loss of one of their. In a somewhat strange way, by being invited to share in this grief, I was able to more fully connect with the parishioners and participate in the mass. To the left of the front entrance to the church. Why yes, that is a Crypt Bar. Mostly pictures. Definitely worth a visit if you find yourself in London. It is less crowded and less touristy than many of the places in Central London. I think I can still taste that spinach bread just looking at this picture… Yum. I know Brits know their tea, but I was under the impression that they preferred the no-nonsense version. This market stall had flavors / scents that would put Teavanna to shame. Fudge. Lots and lots of fudge. Found this interesting installation between Petty Coat Lane & the Market. I think it is lit up from the inside after dusk. Note the proof that this was taken in London: the Pret– similar in content to our Panara, but more plentiful than McDonalds & Starbucks. The Whitechapel Gallery featured modern art, but no photos were allowed. We then headed to the WWI poppy memorial displayed at the Tower of London. 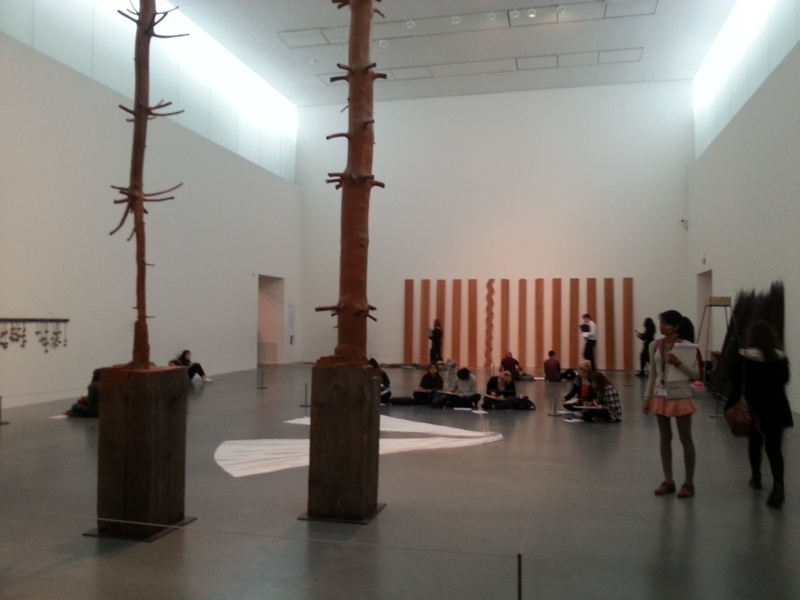 It was amazing to compare these two modern exhibitions. While I didn’t mind keeping a rather quick pace throughout the multilevel Whitechapel Gallery, I trailed along the edge of the Tower of London for quite some time. Though I haven’t developed a definition of art in general terms, I know it when I see it. 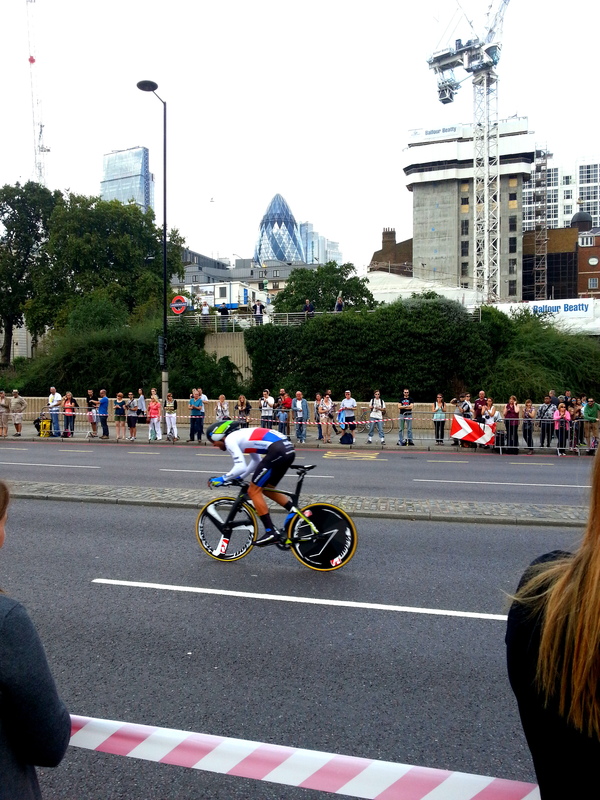 We also found ourselves in the midst of the Tour de Britain. Apparently I’m good at finding bike races, because the Tour de Polone ended in Krakow when I was studying abroad there last summer. On our walk back into Central London, we happened past the Totally Thames festival which focused on celebrating the local area. In addition to the earth-fairy hats (see picture below) there was a petting zoo and a Sing for Water performance at the Scoop, an outdoor amphitheater. Traitor’s Gate. The side of the Tower of London that faces the Thames. Another popular place to visit, even on a Monday! The crowd around the Rosetta Stone. 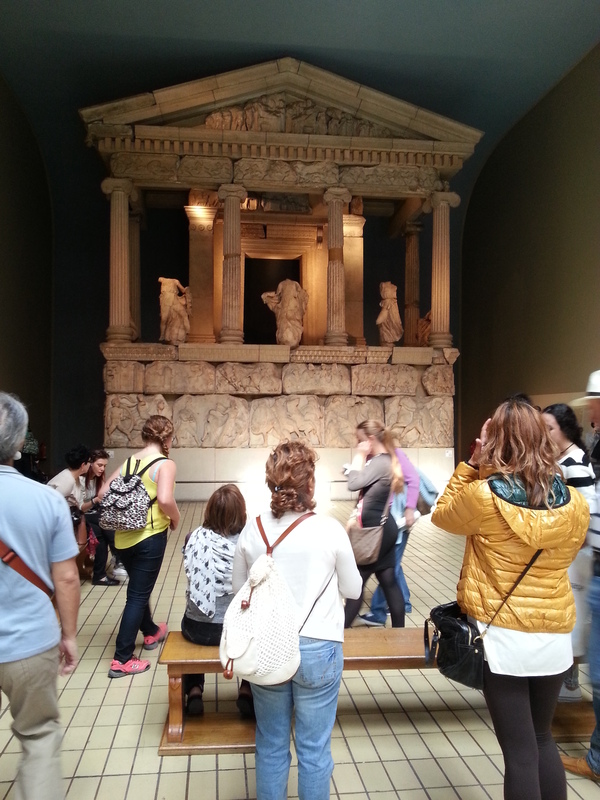 After visiting Athens last summer, I was a bit disappointed to learn that many sculptures from ancient Greece were actually in the British Museum in London. We have nice facilities, we’ll preserve and display them with care, said the Brits. So Greece built their Acropolis Museum in 2009… but they still didn’t get their artifacts back. Though I’m not necessarily supporting the politics behind this setup, it is certainly exciting for me to have access to this Grecian culture in my London neighborhood. Even though classes will be starting soon, I’m looking forward to continuing the adventures. Here’s to a year of discovery, of becoming a Londoner and not just a visiting student in London. On Saturday, I made a plan to go to the Borough Market, National Gallery, & National Portrait Gallery. After the market, I took the train up to Charing Cross and walked to Trafalgar Square to visit the National Gallery & National Portrait Gallery. The former SWE president in me started brainstorming methods for improvement. Should the require you to participate in a tour? Or maybe charge a small admission fee to encourage people to be more conscious about their visit? Or maybe just be more vigilant about chastising people for inappropriate behavior? I was developing my remodeling plan until the end of the tour when the guide came up to one of the women standing behind me. I hope my descriptions were ok for you, the guide said. Was this some sort of critic? I did a bit of obvious eavesdropping and soon realized the woman being addressed was holding a white cane. While staring at people is generally not seen as polite behavior in the US culture (and as far as I can tell this rule remains true in London) I couldn’t help my eyes from widening: (1) in embarrassment for my train of thought that tried to limit access to this treasure , and (2) in amazement that such concerted efforts were being made to support art education for all. Curious about the Gallery’s endeavor to make art accessible to everyone, I did a bit of research to find their Disability Equality Scheme (support for deaf, blind, physically handicapped visitors) and their mission to provide “the widest possible access to the national collection of paintings in the Western European tradition to around 1900, which it houses, conserves and displays.” My fascination with this gallery runs much deeper than the beautiful artwork. Does Princess Diana have an Order of Engineer ring?! A sign indicating the children’s tour. Another example of engaging people of all different backgrounds. Although I am quite used to having international students in my classes, it is a rather new experience being the international student. (I never really classified myself as an international student when I studied Polish in Krakow because all the students fit into that category.) When I first received the invitation from KCL to attend the three day international student orientation, I admit I was not particularly excited. How will I meet locals if I am lumped into a group without any Brits? The pub is not so much a building as a way of life. From what I can tell, the nights end earlier than they do back home, but post-work Happy Hours are more frequent… as in (almost) every day. 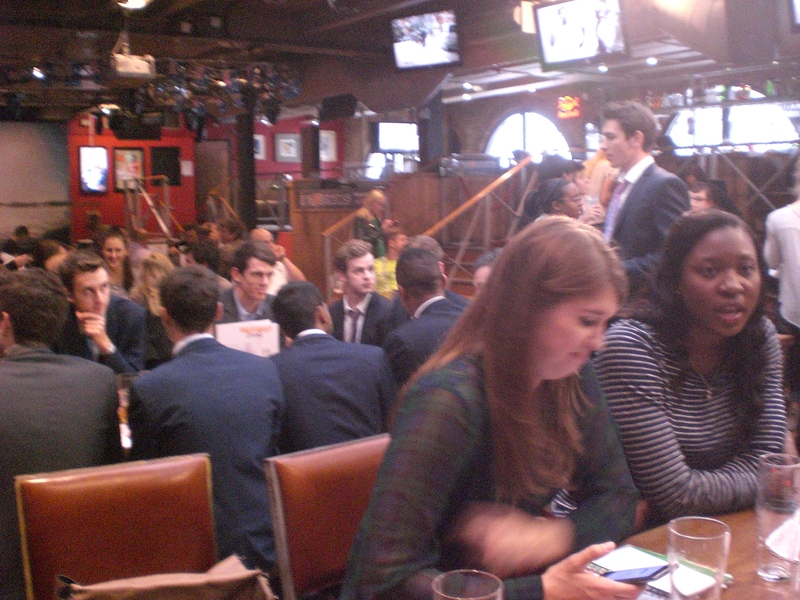 Bringing your backpack to the bar is no longer just for undergrads. At a one week assessment, it seems as if this is a great way to build community with your colleagues. British English is a foreign language. Sometimes its just my midwestern accent. Other times it is an the actual difference in definitions. Andrea: Excuse me. Do you sell sandwich bags? Tesco clerk: Oh! Aisle 10. Come Christmas time I feel like I’ll be quite good at Taboo. I’ve decided to keep a running list of definitions to help with the language barrier. Yes, there is a student discount. Be it a bus fare, restaurant, hostel or theater tickets, there is probably a student discount. If you are not sure, ask. You are not considered cheap if you ask. You’ll just be considered stupid if you spend more than required. The cost of living is indeed high! Here’s a cost comparison between Ann Arbor & London to give you an idea. I knew this coming in, but there are still some sticker shock moments. The most painful purchase so far has been laundry detergent– £10 ($16.20) for 41 washes! Needless to say my expectations for how clean my laundry will be are pretty high. The positive aspect of living in one of the most expensive places in the world is that there is a collective poverty, or really, just a need to budget effectively. Identify the best method for transportation before you head out for the day, make meals at home, check drink prices before heading into a pub, and take advantage of student discounts! Pedestrian lights are mere suggestions. If the street is clear, walk. If a car is in the distance, walk quickly. If a car is approaching but other peds are crossing the intersection, move with the crowd. If only one brave soul is crossing while a car is approaching, use your best judgement. If you decide to move, make eye contact with the driver. Do not be alarmed if the man in the left seat is texting in the car– he is not the driver. Use the directions painted on the street to remind you of the directional flow of traffic. Bikers ride in the road but follow similar rules to pedestrians. If you meet a biker at an intersection, give him the right of way. You will lose in a collision. Public safety operates… differently here. Clearly there are no rules against jaywalking, but laws pertaining to weapons are quite strict. For example, pepper spray is an illegal weapon and thus may not be carried. You may, however, use an item for self defense that is not explicitly a weapon. As presented by a London police officer, raking keys across an assailants eyes should do the trick. Woof. And Americans are stereotyped as being brutal. Another interesting point pertains to sexual assault. Having attended many a required SAPAC (Sexual Assult Prevention and Awareness Center) information sessions at UM, it is taught that sexual assault is never the victim’s fault. Here, however, the language was much less explicit as the officer explained that when he receives a case he examines the victim, too: their appearance / dress, blood alcohol level, etc. And this was just the first few days! Perhaps these were rather obvious observations, but I’m looking forward to learning about more of the nuances throughout the year.